Jill is one of our store managers and events coordinator at Horizon. 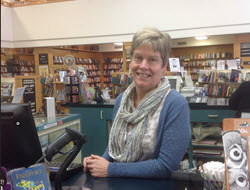 She is dedicated to bringing in all the local authors Traverse City has to offer. If you read the Jan Karon Home in Mitford series, and are aching for another sweet series that takes you into the lives of people that you want to be friends with, An Irish Country Doctor is the series for you! A young, fresh out of medical school doctor, Barry, lands in a small village and begins working with a crusty old doctor that becomes his mentor and sometimes tormentor. The various characters who live in the village and that Barry gets to meet and treat are endearing and frustrating - which makes the book so charming and fun! Since Elizabeth Berg is coming to NWS in May, It's a good time to read her books! Berg is great at capturing everyday people who have a hole in their lives, just like most people do! Its 1964 and in Tupelo, Mississippi, Civil Rights is getting a bit of attention. To go along with that, the rights of disabled people is a theme. Diana, 14 years old, is trying to become her own person, while living with a mother who is disabled due to polio and the day house helper, Peacie, who has as much authority as Diana's mother. As Diana struggles with being a teenager, she learns important lessons about her mother and others. Since Elizabeth Berg is coming for NWS in May, it's a good time to read her books! Berg is great at capturing everyday people who have a hole in their lives, just like most people do! Myra is a nurse who works for an agency, taking care of various patients in their homes, and has never married. Her newest patient is her high school crush, so of course at first it is awkward. As Chip gets to know her, and see her through the eyes of someone dying of cancer, he begins to appreciate what he missed back in high school. Both agonizing and amazing, this book has important messages. Jane Austen is one of my favorite authors, so a mystery series featuring Jane is like finding heaven! One has to ask how it is that Jane Austen stumbles across so many murders, but each of the books in this series is a wonderful excursion into the early 1800s! This one takes place in the last days of 1814, and the wee days of 1815 - and it does not disappoint! Jane is snowbound at an estate with family and friends - and a murder! The main character, Victoria Jones, has been in foster care, but ages out at 18. She has a magical way with flowers, helping people express exactly what they need with exactly the right flower, but as for her own feelings and expression of self, she is at a loss. Victoria is a wounded soul, with a heart of gold and a distrust of almost everyone. Then she meets someone that may be exactly what she needs, but she struggles to trust him. This book made me want to learn the "Language of flowers" and how to express oneself with just the right flower! Tim Johnston is a masterful writer! This book is a hair raising ride up and down a mountainside. A young lady is abducted right in front of her brother's eyes, because he is incapacitated and unable to defend her. What follows is how the whole family is torn apart by this horrendous occurrence, including quite obviously the abductee. The focus switches between the four family members, keeping you intensely involved with all of their physical and psychological plights. Tim Johnston may be in Traverse City in 2019, so be prepared! This is a heart wrenching and amazing book about Anne Frank's sister, Margot. The premise is that Margot survived the concentration camps and is living in Philadelphia under an assumed identity, hiding her true past. In 1959, The Diary of Anne Frank has been filmed, and this new notoriety of the family threatens Margot's (known as Margie Franklin) anonymity. As she relives some of the past in her mind, the present is also giving her cause for anxiety! I just love a good bookstore story! And this one delivers the goods - quirkiness, laughter, romance and tears! The life of A.J. Fikry, bookstore owner, gets turned upside down when he suddenly has a baby "left in his care", which ends up being permanently. How this single "new father"| handles the child, his store, and a long distance romance is charming and humorous and frustrating! The author of this book, that the whole staff of Horizon Books loves, just happened to stop in here one fine day, and we all fell all over ourselves to get photos with her. This is an amazing story of some resilient young ladies who first endured life during the Holocaust only to be placed in a "holding camp" when they arrived safely in Israel. Based on the true events of women who had no family or friends to "claim" them, this novel describes how four young ladies from different backgrounds formed close friendships while being forced by the British to live as detainees. While it seems horrible that these women were treated much like prisoners, there is much hope in their ability to surmount all obstacles. This novel is utterly charming! Don, a scientist who just might be on the spectrum, decides he needs a wife and that he can go about this in a scientific manner. Don sets out his criteria for his perfect match, and then sets about trying to find her. He actually uses a survey for women to fill out, and then Rosie shows up. Don assesses her as someone completely incompatible with himself, but as he gets to know Rosie, he finds himself more and more attracted to her - despite her being a free spirit and very unpredictable. Would you like to have peace in your mind, body and heart? Would you like to heal the emotional hurts and traumas from your past and present? This book gives you the knowledge and tools to help you see clearly what happened to you and to forgive in a way that surpasses our traditional forgiveness. The author doesn't even expect you to believe in all his ideas, nor to understand all your past and present troubles -- you just have to use the tools he gives you! Even better, through your emotional healing. you may even be able to effect some physical healing. And beyond that, your emotional healing can contribute to healing our world!